Actress Rooney Mara (left) was so believable as Mark Zuckerberg's ex that fictional character "Erica Albright" now has an online following. 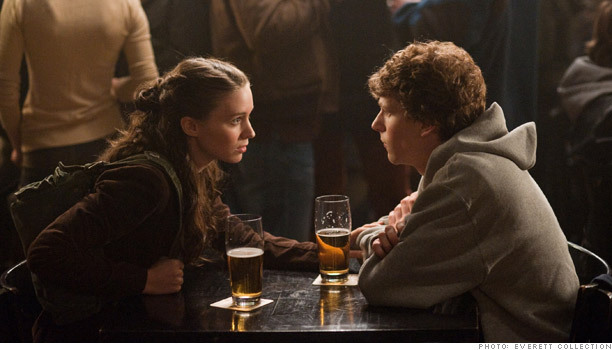 The movie The Social Network created an indelible image of Facebook's origins: Mark Zuckerberg, angry after being dumped by girlfriend Erica Albright, gets drunk and creates a website where users can rate the attractiveness of their female classmates. The Winklevoss twins take notice, hire Zuckerberg to program their Harvard Connection social networking site, he steals the idea, and the rest is history. Or, in this case, fiction. "Erica Albright" never existed (though she does now have her own fake Facebook page), and there's no sign that the woman Zuckerberg cited in his online journal as the catalyst for starting his FaceMash site was ever his girlfriend. For that matter, FaceMash was inspired by the site Hot or Not, and Zuckerberg says he based the idea of Facebook on the existing Friendster. Plus, he's been with his steady girlfriend, Priscilla Chan, since college. "I have been stunned how many people walk out of the film believing they have seen the story of Facebook," says David Kirkpatrick, author of The Facebook Effect. "What's missing from the myth is more understanding of Mark's extraordinary management and competitive instincts." The image of a multi-billion-dollar business as the revenge of a scorned 19-year-old may not be true, but it makes for a better Hollywood narrative than sound management skills.